He’s back. Old Man Winter is here and he is here with a vengeance. For those of us who just survived four polar vortexes last winter on top of 90+ inches of snow, no one is all that happy to see winter here again, and earlier than ever! 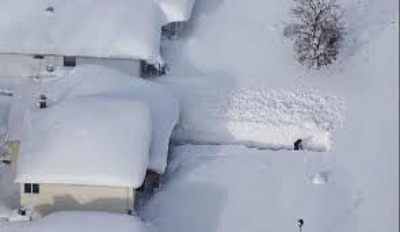 This past week saw the people of Buffalo hit with a snow storm of epic proportions. The weather man predicted two feet, which is bad enough, but then they got seven! I can’t even imagine seven feet of snow. Unfortunately over a dozen people did not survive the storm and my heart goes out to those families. On the news came the aftermath. Patio doors caved in from the weight as did windows. 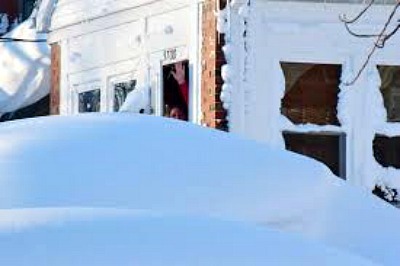 People opened their door and couldn’t see past the wall of snow that then poured into their living room. They were literally trapped in their homes, having to climb out of second story windows to get out. There was the guy who had to walk five miles to get diapers for his baby. On CNN they interviewed a family who was getting worried because the mom had only purchased three days worth of food and the local government was now telling them it might be a week before their residential roads were cleared. It was a quick reminder that the best time to prepare for emergencies and bad weather situations is BEFORE the situation arises. Last winter in Michigan there was a run on supermarkets just before a big snow was predicted to fall. At the time the predictions were for anywhere from 1-3 feet. Shelves were bare, produce sections were picked clean, and there wasn’t a gallon of milk or loaf of bread to be found for miles. People actually got into punching matches over bananas! So what are some simple things you can buy now to have on hand later when you are snowed in under several feet of snow? Everyone knows about the easy stuff, canned pastas, Dinty Moore Beef Stew, and cans of tuna. But what about perishables? How do you keep those on hand long term? With a few easy to use substitutions it’s actually pretty easy. 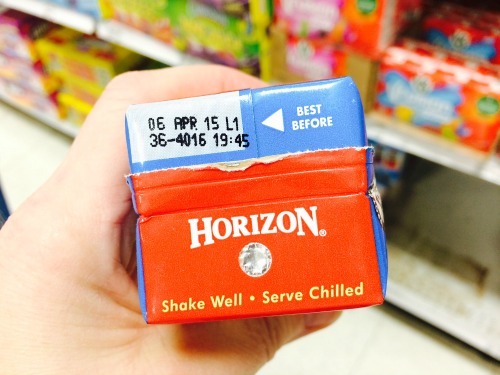 Most people are familiar with Horizon milk boxes. 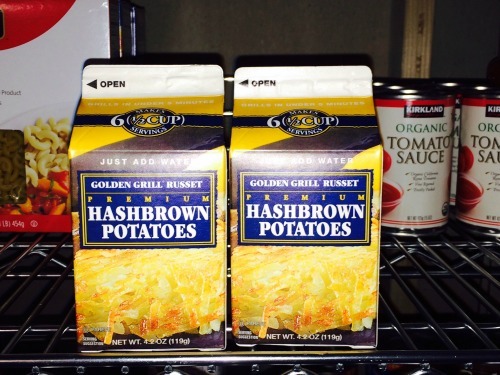 The chocolate milk boxes have been a favorite for children’s packed lunches for a couple of years now. The best part about these shelf stable milk boxes is they have ridiculously long expiration dates. Not only can you buy them in chocolate, strawberry, and vanilla, but you can also just buy plain 1% milk. At Meijer’s today I grabbed the first box I saw. Today is November 23, 2014. 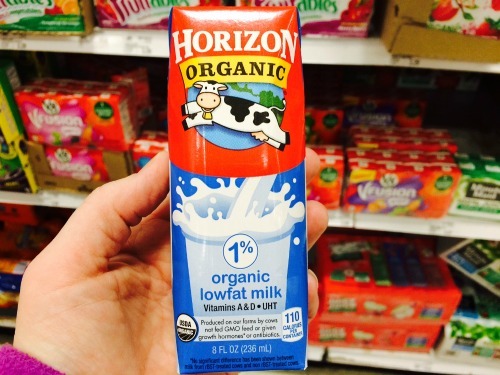 The expiration date on this milk box is for five months from now! This is a great time to buy a dozen of these, hide them on the top shelf so the kids don’t grab them because they are convenient, and have them for an emergency. 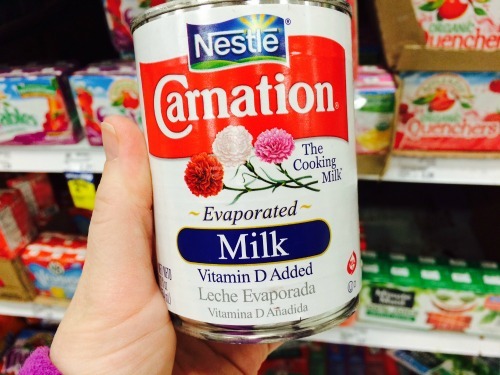 Another great trick I learned to do in a pinch is use Carnation Condensed Milk. I admit I don’t want to drink a big glass of this stuff, but I have used it many times for cooking. 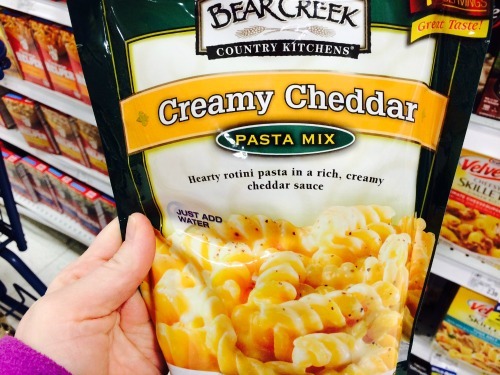 It actually makes for great mac and cheese, works perfectly for baking, and can even be poured over cereal. Next is bread. The best advice I can give you here is to just freeze it! Stick a loaf in your freezer and forget about it. Next week when you buy a new loaf, swap the old for the new. It will thaw on the counter top and be as fresh as just baked. Still, another really good substitute here is a hearty box of crackers. My family is addicted to the Toasted Harvest Wheat. 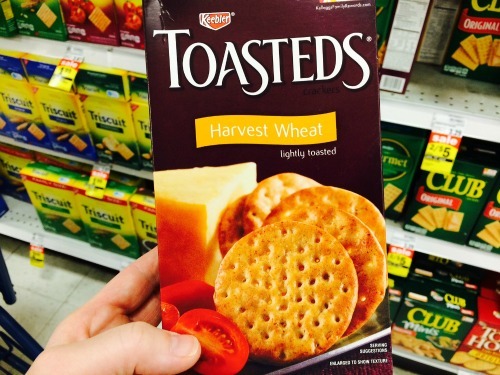 A handful of these with some cheese sticks and deli meat makes for a quick meal. 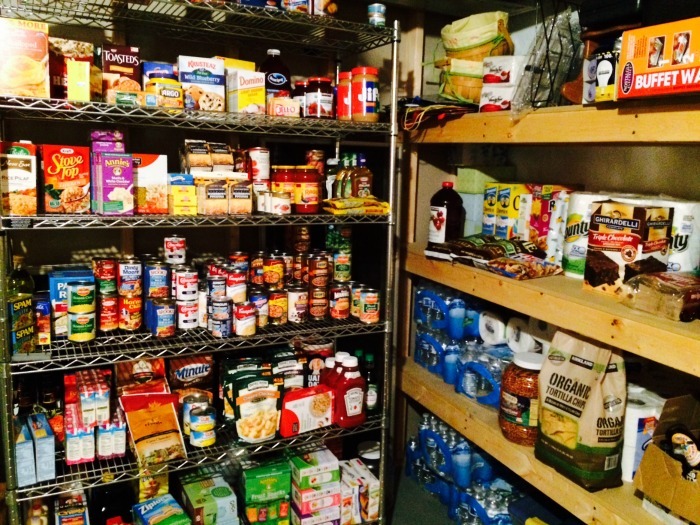 A great idea to keep in mind for these times is to purchase easy prep foods or ones that require nothing more than water to provide a hot meal. 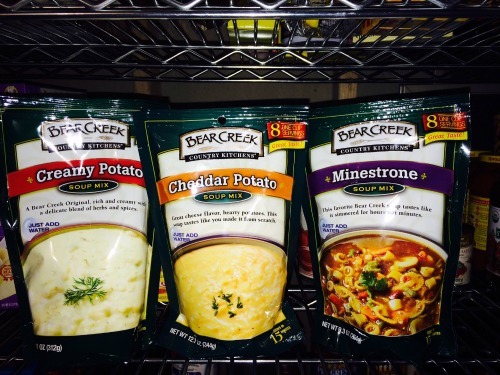 Bear Creek makes some fantastic soups and pasta mixes that need a couple of cups of water and that’s it. I make their Chicken Tortilla soup all the time. I love to add the leftovers from a Costco chicken and a can of kidney beans to it bulk it up, but it is perfectly delicious all on its own. Plus all you need to prepare it is a working stove burner. 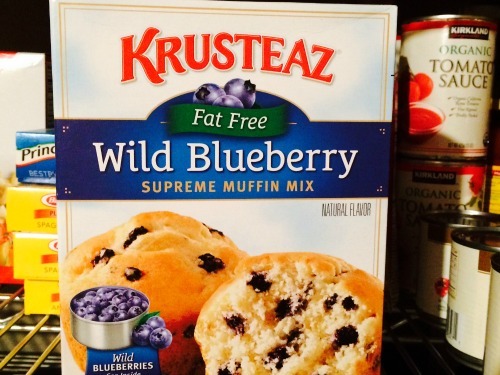 A special breakfast treat is Krusteaz Fat Free Blueberry muffins. First, you would never ever know they were fat free. 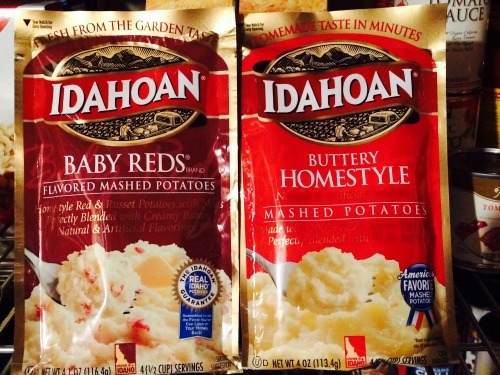 My picky eaters gobble these right up. Second, the only ingredient you need to add to this box is 1 cup of water. No eggs, no milk, or cooking oil is required, so if your oven is working whip up a quick batch! Everyone loves fresh fruit, but again this is an easy one to stock up on. 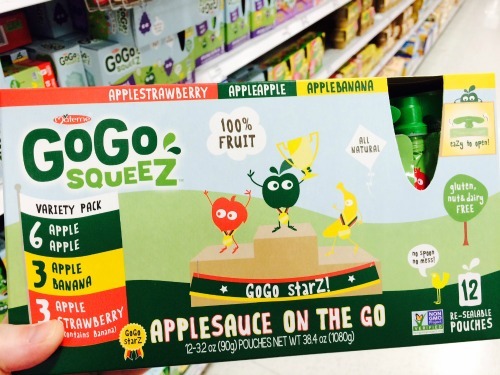 My kids love Go-Go Squeeze apple sauces, raisins, tropical fruit and peaches packed in light syrup. One problem people usually have when blizzards happen is they lose power. I am fortunate to have a gas stove. The oven won’t work without electricity, but I can still use a match to light the burners so I still have access to my cook top even if my microwave and oven are absolutely useless. So stock up now and put your feet up and relax the next time you are snowed it! I hope these suggestions are helpful. 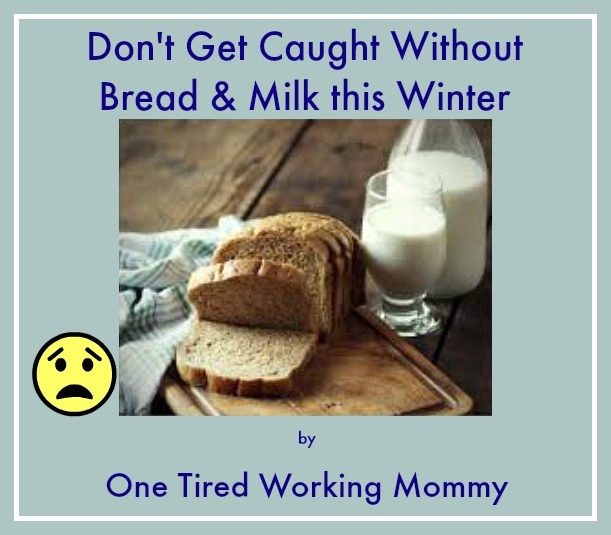 If you have any mommy preparedness advice to offer please share below. If you enjoyed reading this post please click the link below. On Election Day my boys didn’t have school, but as a teacher I still had to go in for a Professional Development day. 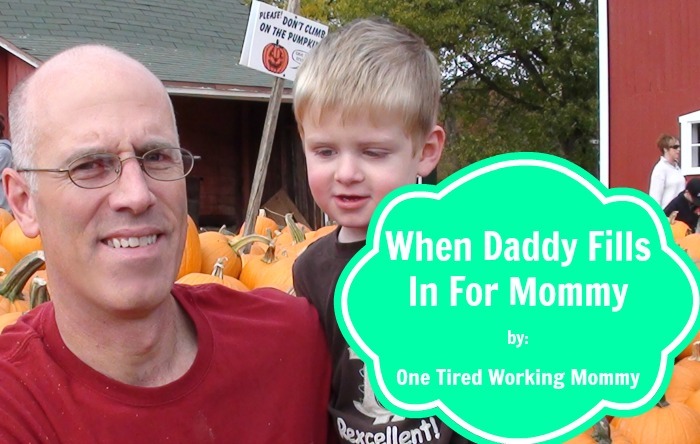 Since I had just used sick days for household and car purposes my husband offered to take the day off of work and take care of the boys. I have learned from past experiences that when three males are left at home all day that the house will be a mess when I arrive. Since I know what to expect I am not that shocked when I walk in and there is stuff everywhere. What I do find funny are the comments my honey says to me. Before I get a lot of people calling me out for husband bashing I would just like to say that a.) I am not bashing my husband. I actually love the guy a lot and I know I am very blessed that he is such a hands on guy, and b.) he is actually pretty capable of running the house when I’m not around. I think all ladies would agree with me, however, that guys and girls look at things a bit differently. What he said: I washed a couple of loads of laundry for you. What this means for me: There are now three laundry baskets of clean clothes sitting in the living room. The clothes are clean, but since they have been sitting wadded up for several hours they are now hopelessly wrinkled and I will probably just rewash them as opposed to trying to iron all of that. What he said: I fed the boys lunch today. What this means for me: The kitchen has been ransacked because he couldn’t find what he was looking for. Half of the kitchen contents are now in the wrong place, the sink is full of dishes, and the table is covered in crumbs. What he said: I took care of dinner. What this means for me: He picked up a rotisserie chicken at Costco. Now all I have to do is make a couple of side dishes, reheat the chicken and serve dinner. What he said: I went on line and paid the bills. What this means for me: I now have to defend why $68 spent at Sephora was a necessary expenditure as well as my subscription to Boxy Charms and Popsugar. For some crazy reason he disagrees. Do you and your hubby have different opinions on how things should get done? Share below! I love candles but it is difficult for me to go out and buy scented candles because so many of them are too strong or the synthetic fragrances used to scent them will trigger a migraine. The only candle I really buy that doesn’t make me sick is Macintosh Apple from the Yankee Candle shop. So, I was really excited when Rachel from The Old Factory contacted me and asked me to review their soy based candles made with essential oils and cotton paper wicks. Soy candles burn more cleanly than paraffin candles so they off-gas less. Further, fragrance contains phthalates which has over twenty years of research showing that they mess with hormone levels and reproductive health. Scary! Essential oils don’t contain phthalates. Further, some poorly crafted candles or candles produced in other countries and imported here have been shown to use lead in their wicks. There is NO safe level for lead contamination. I told Rachel I would be happy to review the candles they sent me and leave a fair review of the product. In the mean time I went to Amazon to view all the candles they sold and check out the price. 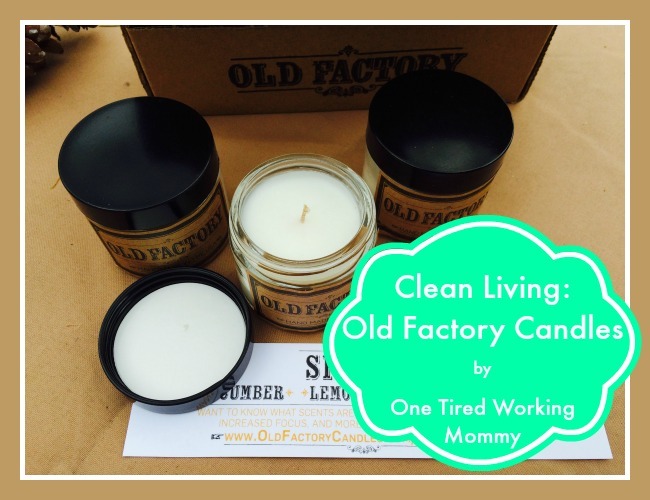 Old Factory candles come in three packs in a wide range of scents. I was also surprised to see that they had a number of “male” inspired scents as well as the traditional floral, holiday, and fruit ones that women are so fond of. A three pack of candles from Amazon costs $30.99 but they are currently on sale for $25. The good news is that they qualify for free shipping if you spend $35 through Amazon, so add on a new book or some other item to avoid S&H. 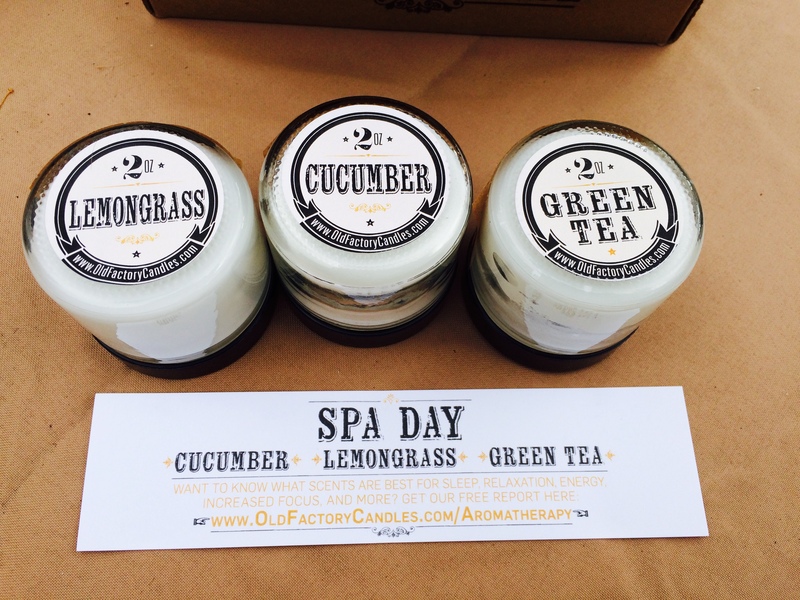 I requested the Spa Gift Package with comes with Cucumber, Green Tea and Lemongrass. When the candles came I will say that I was a little surprised by their size. Each candle is two ounces in size. I think in my mind I was expecting them to be larger, something similar in size to an Airwick or Glade candle. Still, there was no denying the quality of them. First off, the glass jars are very cute and well made. Once my candles are all used up I have every intention of keeping the jars and repurposing them. Each candle smelled exactly as labeled. I think my favorite one was the Green Tea. I burned a different candle in my room each night until I tried all three and I was very happy with the aroma in the room. The entire room was scented pretty quickly. The lemongrass is naturally a stronger smell so I recommend using that one in a larger room. It did over-power my bedroom after a while. Each candle is guaranteed to burn for 20 hours. Another plus to the candles are that they are made 100% in the USA so if you believe in buying local or supporting small businesses this is a great company to support. Because the packaging is so cute I can honestly see myself purchasing some of these to use as hostess gifts in the coming holiday season. I know I will be giving a cute, fun, and safe gift to friends and loved ones. **Full Disclosure: I was not paid to write this post. I will not make a commission from any clicks from my website. My only compensation was a single three pack of candles to try for review. My opinions written here are honest and genuine.